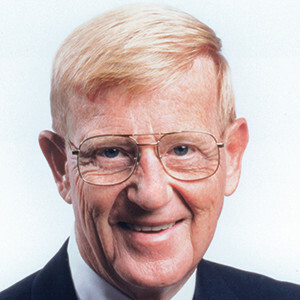 Lou Holtz is one of the most successful college football coaches of all time, an author of multiple books, and an iconic sports broadcaster and commentator. Holtz accepted his first of seven head coaching jobs at the college level with The College of William and Mary in 1969. His career in these positions has established him as one of the greatest turnaround coaches of all-time. Despite never inheriting a winning team, Holtz compiled a 243-127-7 record. His 12 career postseason bowl victories ranks him fifth among coaches in the history of the sport in postseason bowl victories. In 1970, his coaching led struggling William and Mary to the Southern Conference title and an appearance in the Tangerine Bowl, the only post-season appearance in the history of the school’s football program. In 1972, Holtz took over a North Carolina State team plagued by losing seasons. Holtz’ teams played in four bowl games and had a 33-12-3 record in four seasons. In 1977, Holtz began a successful seven years as the head coach of the University of Arkansas Razorbacks. He compiled a 60-21-2 record and reached six bowl games. In 1984, Holtz took over as head coach of the University of Minnesota Golden Gophers, a team that had only won four games in the previous two seasons. But, in 1985, under Holtz’ leadership, the team posted a winning record and were invited to the Independence Bowl, where they defeated Clemson. In 1986, Holtz left Minnesota to take over the then-struggling Notre Dame football program. The following season Holtz led the Fighting Irish to an appearance in the Cotton Bowl Classic. And the season after that, the team would win all 11 of their regular season games and claim a consensus national championship. The following season, Holtz’s team would set a school record with a 23-game winning streak. Holtz would end up posting an overall 64-9-1 record with Notre Dame. He also took the Fighting Irish to bowl games for nine consecutive seasons, a feat which is still a Notre Dame record. In 1999, Holtz came out of retirement to coach the University of South Carolina. The year before Holtz arrived, the Gamecocks were 1-10, but by his second season with South Carolina, Holtz had improved the team to an 8-4 season winning the Outback Bowl. Under Holtz’ leadership, the Gamecock’s posted their best two-year mark in school history from 2000 to 2001, going 17-7 overall and 10-6 in SEC Pay. Upon his exit, University of South Carolina had posted AP Top 25 finishes in 2000 and 2001 and made consecutive New Yearï¿½s Day bowls for the first time in its history. In recognition for his extraordinary accomplishments as a coach, Holtz was inducted into the College Football Hall of Fame in 2008, a very selective honor awarded to only approximately 1 in 5,000 people who have played or coached college football. Holtz has authored three New York Times best-selling books: The Fighting Spirit; Winning Every Day: The Game Plan for Success; and Wins, Losses and Lessons. Lou Holtz knows how to win and the Bakersfield Business Conference looks forward to hearing many of his best coaching and success secrets.